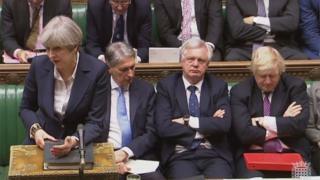 Philip Hammond was very visibly sitting alongside Theresa May as the prime minister made her statement on Article 50. And the push and pull between the UK's two most important addresses as Britain starts the process of leaving the European Union - No 10 and No 11 - was evident in every word of the statement and the following letter triggering our exit from the EU. Mrs May talked of prosperity, quite deliberately, more than once. She said that Britain would be a "magnet for international talent", that entrepreneurs would be welcome and that the UK would be a committed partner for the EU, which Britain wanted to flourish. You can almost see the hand of the Treasury in every part, with its concern that the toughest economic period is not behind us, but is still to come. In the Article 50 letter published just after Mrs May's statement, many of those who share that feeling of economic concern will have read much to welcome. The letter says that the government wants to see "as little disruption as possible on each side" (code for no "cliff edge" as we leave). What do businesses want in Brexit talks? It also wants to see "certainty" as soon as possible (suggesting that there might be rather more transparency about the process than previously thought, giving reassurance to businesses). The letter adds that the UK wants an ambitious free trade deal and that both sides would "benefit from implementation periods to adjust in a smooth and orderly way to new arrangements". Cue sighs of relief from the chancellor and No 11. The prime minister has put the economy at the heart of this process. And she certainly has reduced the volume of excited chatter that Britain could walk away with no deal and "fall back" to World Trade Organization rules, which could see significant tariffs on sectors such as cars as well as a probable increase in vital "non-tariff" barriers, which control how rules such as consumer rights are enforced across borders. That would certainly be a major change and, many argue, highly disruptive. Mrs May, the former home secretary, links the talk of prosperity with the issue of security, not a traditional fit when it comes to discussing economic arrangements to increase trade between separate interests. Rupert Harrison, former chief of staff to George Osborne, called it "punchy". "Weakening our co-operation for the prosperity and protection of our citizens would be a costly mistake," Mrs May says in the letter, which mentions security no fewer than 11 times. The key will be how the 27 other members of the EU respond to that direct link. And to begin to understand what that reaction might be, I returned to an interview I did at the World Economic Forum in Davos in January with the deputy Prime Minister of Poland, Mateusz Morawiecki. One of Poland's biggest concerns, with Russia on its doorstep, is security, and Britain's continuing role in backing a robust attitude to President Vladimir Putin. "How important is Britain's security role and should that be made part of the negotiations around Brexit?" I asked him. "It is very important. There are only three countries of Nato, the United States, the United Kingdom and Poland, that spend 2% or more of GDP on defence expenditure and 20% of this on military equipment," he answered. "So it is very important for Poland and the UK to work together [on the] dangers that are around us, and Russia is definitely one of those and the situation in Ukraine. "And yes, Poland and the UK can be strong links for the platform around security, to really cement the solidarity of the transatlantic partners." I pushed a little more. "Should that be part of the negotiations for Brexit?" "I am not sure it should be part of the Brexit negotiations because Brexit is Brexit," Mr Morawiecki said. "Brexit is the UK leaving the EU." Mrs May has set a new course. The economy, trade and security, in her eyes, are now inextricably linked.